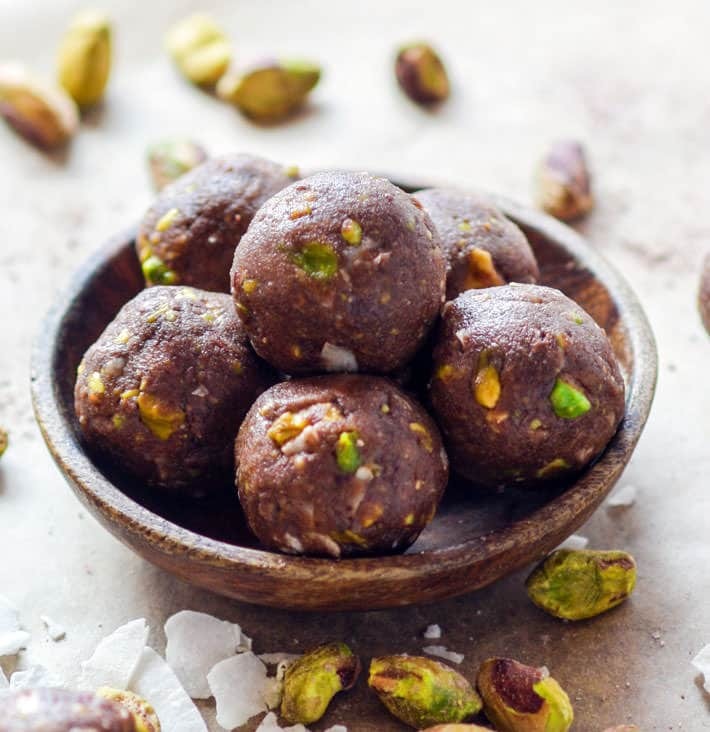 Paleo and Vegan friendly Dark Chocolate Coconut Pistachio bites! A crunchy, lightly sweet, delicious snack BITE that requires no baking! 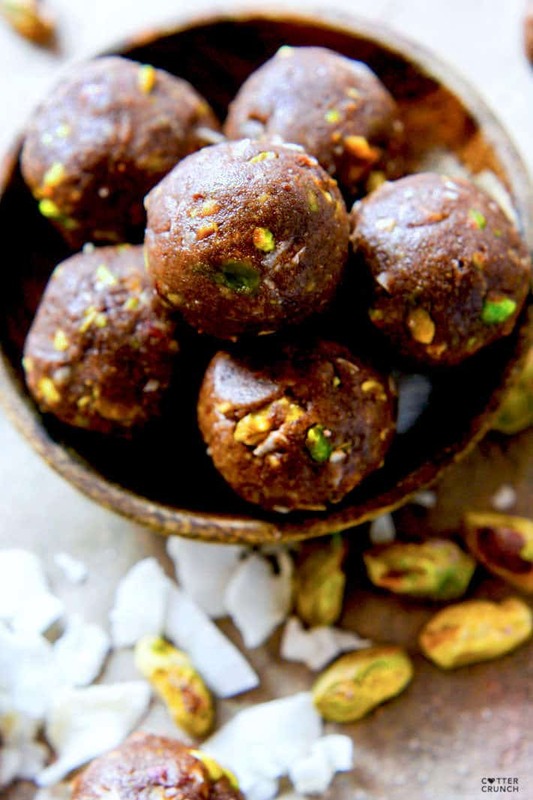 These little chocolate bites are naturally sweetened and packed healthy fats! I’m going to be completely honest here. I dropped the “ball” on getting this giveaway together. The past few giveaways have been AWESOME but I swear September just crept up like a spider. Silent and deadly! Just kidding, not deadly, but silent for sure. My brain didn’t even realize that September was around the corner until I saw a few “best of August” posts pop up. Uhh… whoops! Regardless of my brain fog, I conquered through and made the September healthy bite flavor! Yes! And the flavor totally makes up for what else is lacking with the giveaway. Because, you see… I don’t have an “extra” product to giveaway this time. I forgot to ask one of my favorite companies and didn’t feel like scurrying around to grab one. So instead, I’m going to tell you about this amazing flavor, then I’m going to giveaway 2 BOXES of bites. Not one, but TWO! Will that make up for my forgetfulness? Please say yes! Okay, I hope you said yes. Now, back to my main objective. This flavor. It has my favorite nut which also happens to be my favorite color. Yep, green pistachio! 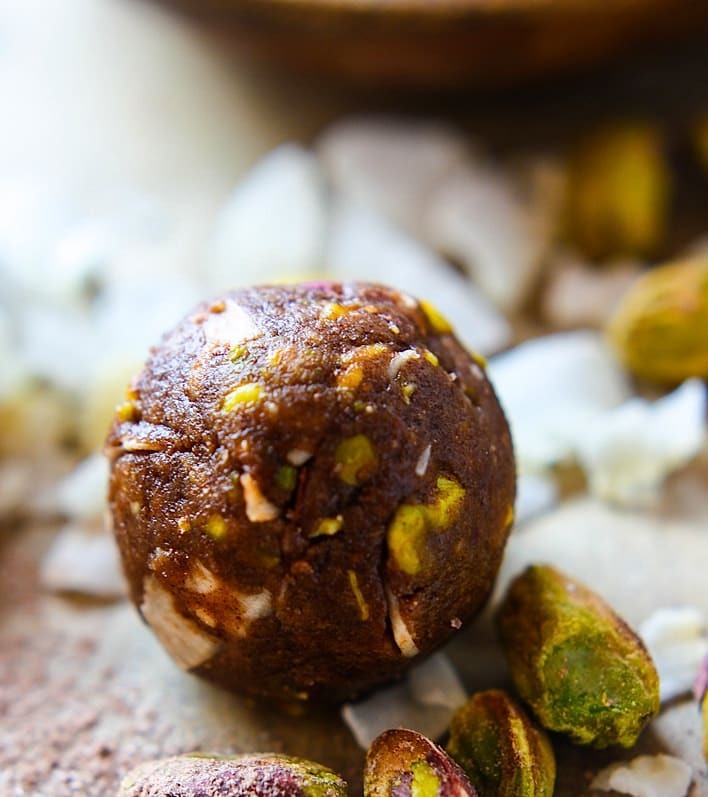 And when you take the buttery flavor (and beautiful color) of pistachio, combine it with a slightly bitter but rich taste of dark chocolate, but then sweeten it naturally with coconut and honey… YOU GET THIS! 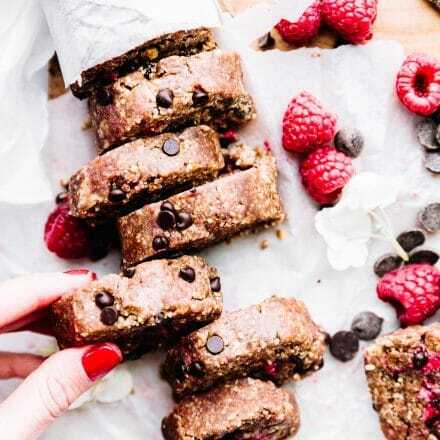 A crunchy, lightly sweet, delicious HEALTHY BITE! Yea baby! In fact, the texture reminds me of a Krinkle bar, crunchy on the inside, creamy on the outside. Can you handle that? This combo was so good I shared them with only a few of my favorite people and then ate the rest within a few days. They are ALL gone, which means I need to make more stat! I’m okay with that, it seems to be a good problem, ya know? Because these bites are UBER healthy! Packed with all the good fats you need and antioxidants. Hmmm, maybe I should change the name of this recipe. 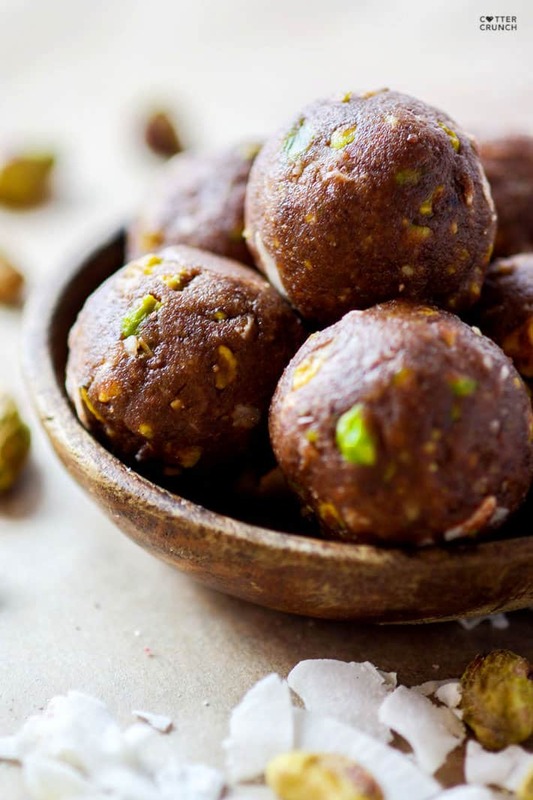 Chocolate Coconut Pistachio UBER HEALTHY bites anyone? That being said, let’s get to the recipe and giveaway already so I can go make more. 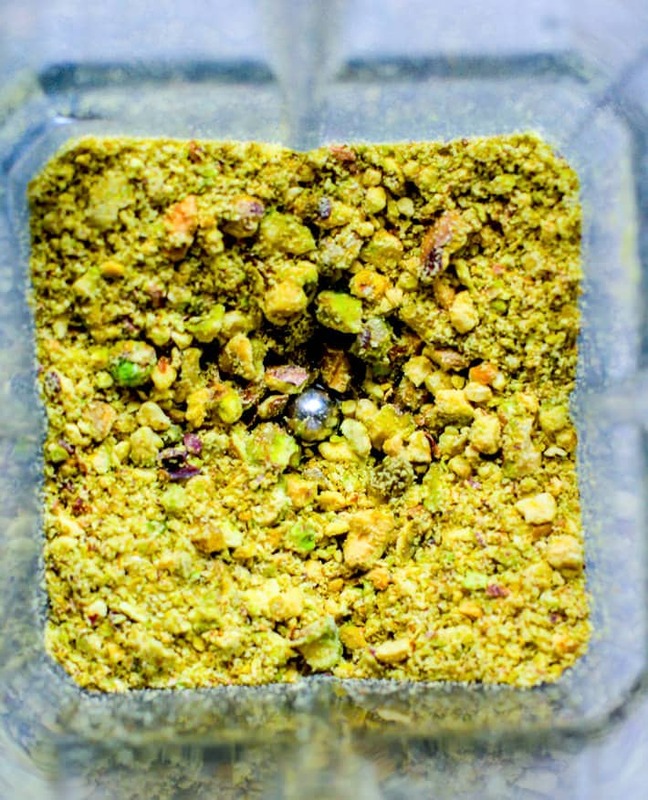 Blend pistachios in a food processor. Transfer into a large bowl and add in all the remaining dry ingredients with the honey being the last . Add your extracts and and any other add ins. Mix well (I use my hands) then roll into bite size balls. Coat bites (once frozen) cocoa or coconut flakes if desired. If the batter is too dry add more almond butter and/or honey. If it’s too wet, add more coconut flour. Makes about 26-28 bites. Freeze or keep in refrigerator to maintain freshness. If are looking to reduce the sugar intake, reduce honey to 1/4 cup and add in 1 more tbsp of nut butter (creamy natural). I tried it this way as well and used 2 tsp Nektar Naturals honey to sweeten these without the extra sugar. This giveaway is purely my own doing. So two winners ya’ll! I will definitely ship to Canada too! And if you are international and win, I’ll send you the First Edition Healthy Bites Ebook. It’s all about sharing the love here, right? Mwah! Favorite nut/chocolate combo? Are you a pistachio fan? 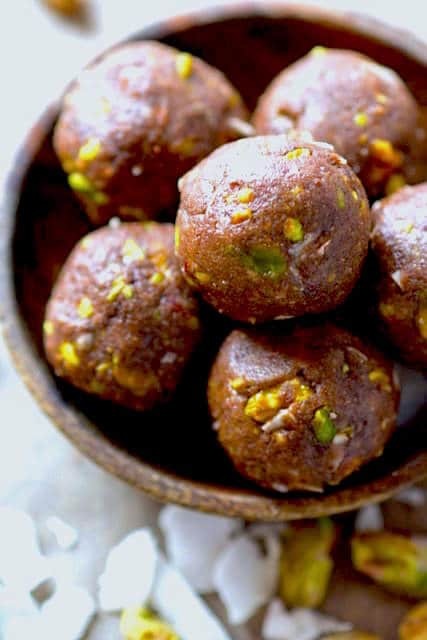 #Paleo and #Vegan friendly Chocolate Coconut Pistachio bites! Naturally sweetened and packed healthy fats! I love hazelnut and dark chocolate together! You do realize that chocolate, pistachio, and coconut are like a dream for me, right? STOP INVADING MY MIND AND MAKING MY DREAMS COME TRUE. Wait. Don’t. I didn’t mean that. I love chocolate, almonds, and coconut! Pistachio is one of my favorite nuts though! ohhh i need to make that flavor next! Chocolate and pistachios go so well together but I feel like pistachios don’t get used nearly enough. LOVE THESE. My favorite chocolate/nut combination is dark chocolate with hazelnuts. I love just about any variation of nuts and dark chocolate ? how did i miss those? off to read now! These look deeeeelicious. Pistachios are so great. Definitely an underrated nut! Plus, chocolate. DUH <3 Pinning! These will be great for my kids lunches! I cant wait to make them! I just pinned them! I love dark chocolate and raspberry combo! Everything Cotter does is divine!! I have never combined pistachio w/ chocolate but I love both so how could anyone go wrong with this? Yum! I love your healthy bites!! These look so fun! Usually I’m all about the peanuts and chocolate, but now I want to give pistachios a whirl. Holy jeez, pistachios have been my everything lately! I can’t get enough. They’re my favorite nut, by far. If I had to pick a favorite nut/chocolate combo I would say the peanut clusters my mother makes every year for Christmas. 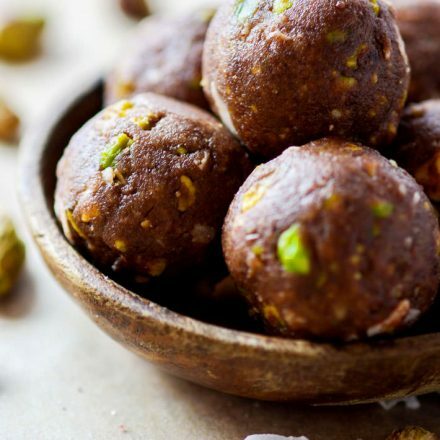 Pistachios, chocolate and coconut sounds awesome-could be one of my new favorite combos! 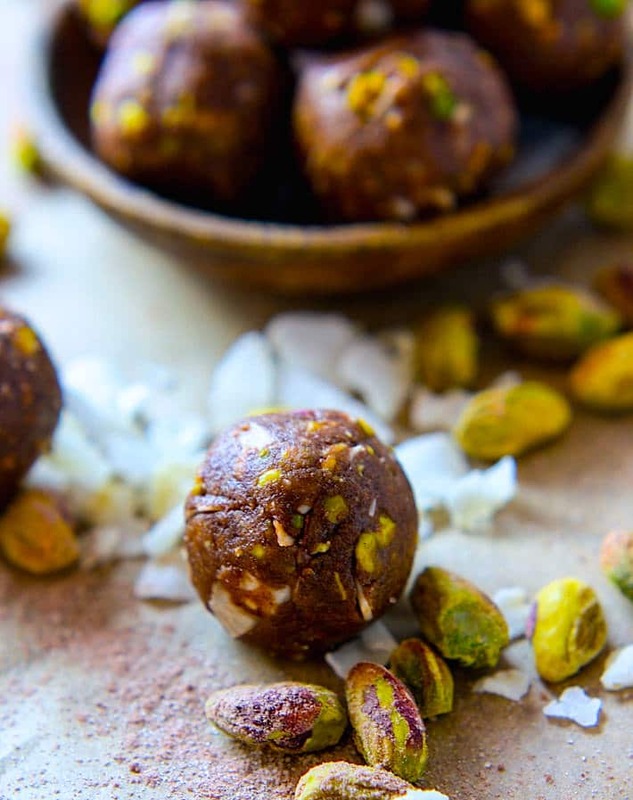 OMG – yummmmmmmmmmmm – pistachios are amazing AND coconut!!!!!!! We are so on the same wavelength. 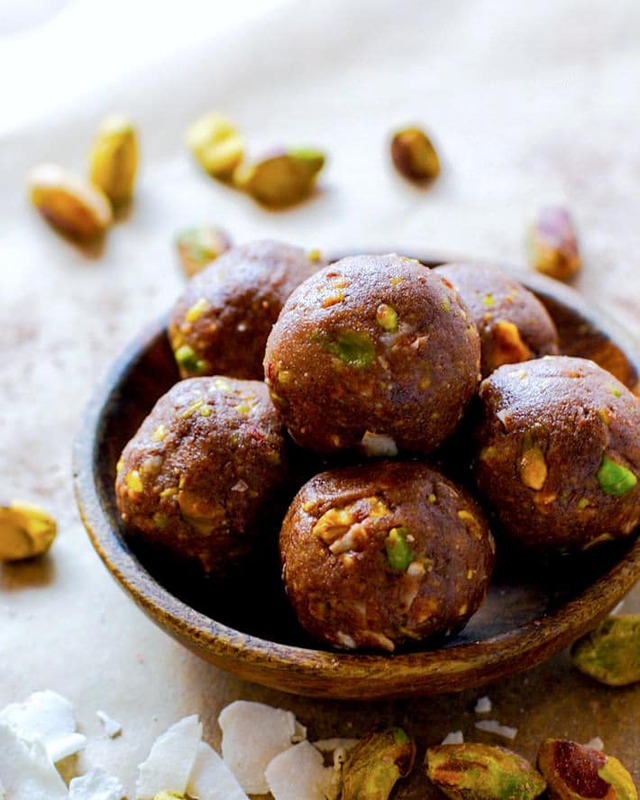 I just made some pistachios bites last weekend not with chocolate though. I need to try yours! Pistachios & chocolate sound heavenly. oh can’t wait to check them out! I love dark chocolate almonds! I am a big fan of chocolate covered cashews! But these sound yummy too; can’t go wrong with chocolate! Oh, Lindsay… you just have the best balls. I’m pretty sure two boxes of bites is a better gift anyway!! Oh I just love pistachios!! These sound amazing, can’t wait to try them! 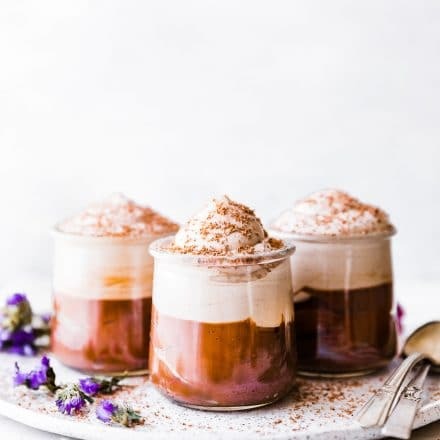 So my ‘Bars & Bites’ Pinterest board has basically been taken over by all of these recipes you’ve been sharing lately! LOL! And every week I tell myself I’m going to try them.. and then I always get caught up. I NEED to try this one though. They look so yummy! 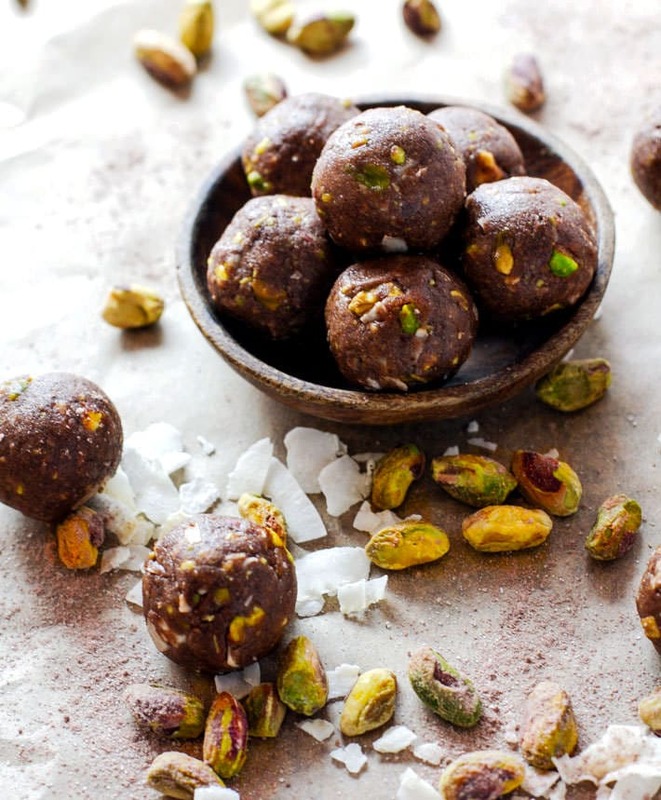 I’ve never tried chocolate and pistachio but these look so yummy! My favorite chocolate nut combo is chocolate and cashews. Really, though, you can’t go wrong with chocolate and any nut. I love any kind of dark chocolate and nuts and sea salt! just a big spoonful of peanut butter & co’s dark chocolate PB! I love chocolate any way I can get it, but I agree with you. Pistachios chocolate are an awesome combo (with cranberries!). Holy Moly – these looks amazing. I absolutely love pistachios and basically any kind of chocolate. These are right up my alley! What a unique combo! You have so many great ideas! As for me? Can’t go wrong with ANY nut and chocolate…But I love the simple dark chocolate with almonds kind of crunch in my mouth! Fingers crossed for the giveaway – you are so generous! There is no way chocolate and nuts can be wrong. So excited for healthy bites. I love chocolate and sunbutter. This flavor combo sounds pretty much perfect! I love the turtles made with pretzels, caramel and chocolate! chocolate and almonds are always a winning combo in my world! Chocolate and any nut strikes my fancy! Almond + dark chocolate = fantastic flavors. I need more pistachios in my life. Dark chocolate and salted cashews! Ooh gotta get my hands on these bites!! I love dark chocolate cashews and peanuts! I love dark chocolate and almond! I need these. Like immediately. Mmm!! I saw this on instagram and died. Not to mention that those pistachios are gorgeous. Pinning this! oh yay! You would love them then Beverley! Dark chocolate + Sea Salt + Almonds or Pistachios! also subscribed to the newsletter! I just love dark chocolate and all-natural peanut butter – not the super sweet peanut butter with all the additives! This look fabulous! My favorite nut/chocolate combo would probably be salty peanuts with milk chocolate – that sweet & salty combo gets me every time! 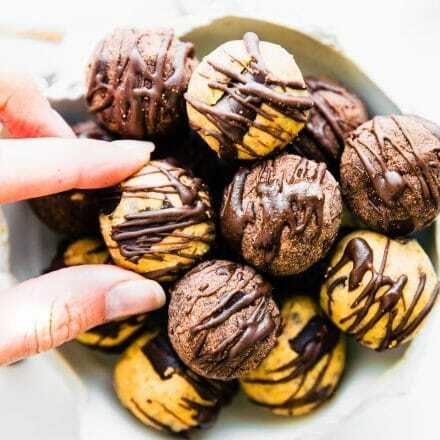 I like chocolate and pecans in truffles, so I know I will enjoy these truffle size bites. I really enjoy coconut and pistachios & I am mostly vegan, but vegetarian. Thanks for another great paleo recipe! my favorite.. chocolate & almonds! Dark chocolate and almonds! thank you! I love chocolate covered almonds. I have never tried a chocolate covered pistachio but it sounds interesting! I can’t get enough of chocolate and almonds. Mmmmmmmm! Ugh, this is a tough one. Prob a scoop of NuttZo Power Fuel with a square or two of stevia-sweetened dark chocolate. To be totally honest, I’d much rather have these than a different product. I’m digging the flavor profile and can I get an Amen for pistachios. One of my favorite nuts. I like sunflower seeds and milk chocolate. Anyone else find these to be super dry? I added a lot more almond butter and honey, but they are still dry. 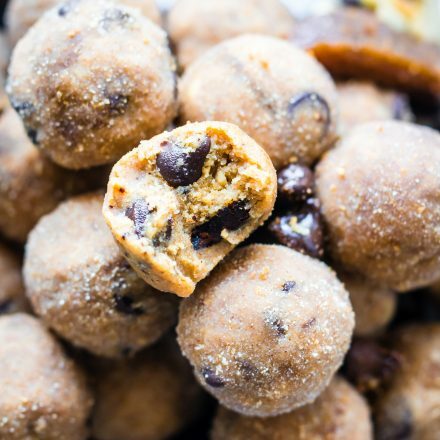 If I make these again, I would probably start out using much less coconut flour. will not that. And I just sent you an email. I had other try this too and work out great. sorry about that. These treats look amazing! But I’m confused about the unshelled pistachios. It’s one cup in the shell or is it suppose to be 1 cup already shelled? Thanks! Looking forward to making these soon! oh, sorry about that. Yes, unshelled 1 cup. Keep me posted! Oh sorry, yes I meant to give maple syrup as vegan option. The food is very attractive. I love this dish. Is this one cup pistachios measured out in the shells – then shelled to proceed with the recipe or 1 c shelled?